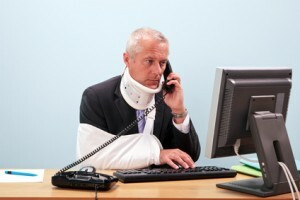 Beware of Social Media Posts After a Work Injury When filing a workers’ comp claim after a work injury, it is important that you watch what you post on Facebook and on other social media sites. One of Jeff Foxworthy’s best recurring bits involves his description of certain silly or stupid behaviors followed by him saying “Here’s your sign!”, meaning that everyone then knows who you are. A considerable number of “Here’s your sign!” stories could result from the stupid ways people open themselves up to scrutiny and suspicion when they have a workers’ compensation claim. The Ohio Bureau of Workers’ Compensation loves having its name in the news. (Well, not always… remember Coingate? Stories about claims examiners stealing funds?). Every week, one or two stories are released detailing how the BWC is protecting the state insurance fund by prosecuting people for workers’ compensation fraud. Just this week, a South Euclid (Cuyahoga County) woman was ordered to repay more than $32,000 in disability compensation after it was discovered that she was working while collecting benefits. She was also sentenced to serve 11 months in prison suspended for five years of community control. While this woman’s employment was discovered through a cross-match report from the Ohio Department of Jobs and Family Services, the BWC Special Investigation Unit (yes, sort of like the guys on TV) and employers no longer have to rely on the time-tested methods of hiding in the bushes or in a van across the street from someone’s house to take pictures of them doing things that look suspicious. Nowadays, they have access to your life in a way they never did before: they can go on Facebook, Twitter or blog posts and see how you spent your weekend! This makes the job of the private investigator much easier. While many still hang out in bushes or vans, cameras at the ready, it’s much easier to read what you’re saying about your life, your activities and even your work injury. Convincing a hearing officer that your back injury prohibits you from totin’ that barge and lifting that bale is much harder when there’s footage of you reeling in that record bass, hang gliding in Arizona or jet skiing at Alum Creek. If you’re caught doing something you shouldn’t be able to do with your injuries or that your doctor said you can’t do, your benefits are at risk. The BWC and self-insured employers look for reasons to cancel or deny your benefits. While it costs them money to hire investigators, they save much more in compensation and benefits they no longer have to pay. Beyond social media, investigators still follow you in real life too, not just online. Equipment available to investigators has also gotten much more sophisticated. Micro video recorders in baseball caps are nearly undetectable to the naked eye but produce surprisingly clear video and audio. They can also be positioned on gym bags at your local health club monitoring your physical activity. Does this stuff happen all the time? No, but as the costs of investigation decrease (how difficult and time-consuming is it to check someone’s Facebook page? ), the frequency would naturally be expected to increase. Should you be paranoid? No—but know of the risks. The best way to protect yourself and your benefits is to be honest with your doctor, follow his/her recommendations and restrictions, and don’t push yourself to do things you shouldn’t be doing (yard work, heavy lifting, etc.). Even seemingly innocuous activities can look suspicious. Golfing, lounging by the pool to work on your tan and dressing like the Neutron Man at Buckeye games may be within your restrictions but these activities can look bad to a hearing officer who hasn’t been able to afford a vacation in a couple years.